A promising solar cell material is making big waves for its ability to harness the sun’s energy as inexpensively and easily as current silicon-based solar technology. University of Nebraska-Lincoln engineers have discovered that it’s even better than previously thought — at least 3,000 times better. Fine-tuning this material — a class of compounds with the same crystalline structure known as perovskites — to better capture energy has advanced rapidly in just a few years. It now rivals silicon’s 20 percent energy efficiency with the promise of even greater efficiency. Yet progress into determining what makes it so special has been slow. 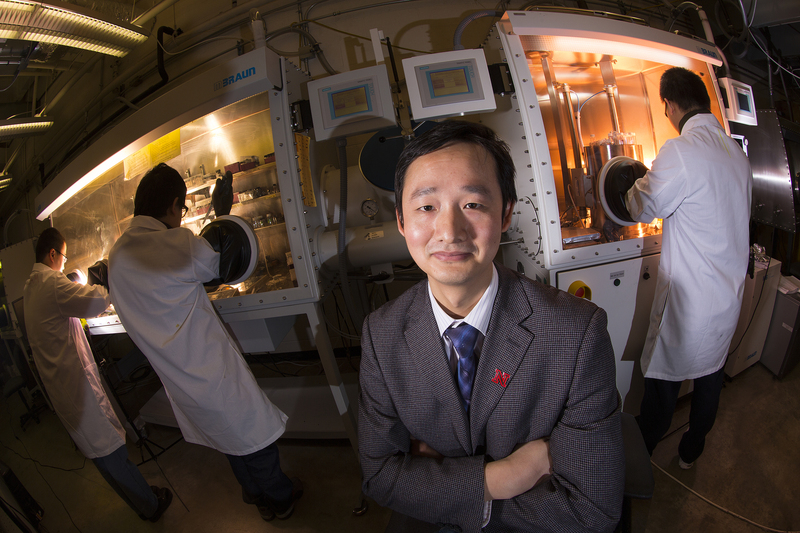 Jinsong Huang, UNL associate professor of mechanical and materials engineering, and colleagues discovered that the physical property that determines energy efficiency in perovskite is much more promising than previously demonstrated. The team reported its findings this week in Science Xpress, which provides electronic publication of selected papers in the journal Science in advance of print. To convert sunlight into electricity, solar cells use semiconductors. The photons in sunlight knock loose the semiconductor’s negatively charge electrons, leaving behind a positively charged “hole.” The electrons and holes migrate in opposite directions through semiconducting materials to create a flow of current. That current is harnessed as electricity. How much energy is generated depends, in part, on how far the electrons and holes, or charge carriers, can travel before recombining, a property called the carrier diffusion length. The longer the diffusion length, the greater the energy efficiency. Previous studies had found perovskite lengths in the range of 1 micrometer. Huang and his team created a large, single perovskite crystal using a low-cost fabrication technique they developed previously. Subjecting it to sunlight resulted in diffusion lengths of more than 3 millimeters, 3,000 times longer than previously reported. They also discovered that single crystals absorb a broader spectrum of light, approaching the near-infrared range, than the polycrystalline thin-film structures used to date. This characteristic would allow for more efficient harvesting of sunlight, which contains a significant portion of its energy in the near-infrared range. Achieving the intrinsic limit of perovskite’s energy-generating capabilities helps scientists better understand the material and its potential for significantly improving solar technology. In addition, they deduced that subjecting a much larger crystal than is possible today to weaker light would result in diffusion lengths of 33 millimeters. “To the best of my knowledge, this is the longest carrier diffusion length we can get for any material,” Huang said. The longer diffusion length under weaker light increases perovskite’s potential for use in semiconductor detection of X-ray and gamma radiation, Huang said. Radiation detectors work by measuring the number of charge carriers — the electrons and holes — generated by a radiation source. Today’s detectors require high voltage to work, which is unrealistic in many settings, such as a medical X-rays. The longer diffusion lengths would allow much lower voltage and, therefore, many more applications. Another potential application is harvesting gamma rays as an energy source. For example, perovskite-based products might be able to convert radiation in space into electricity to supplement the solar energy that currently powers satellites. Huang’s co-authors are Qingfeng Dong, Yanjun Fang and Yuchuan Shao, all from UNL’s mechanical and materials engineering department, and Padhraic Mulligan, Jie Qiu and Lei Cao, of Ohio State University. The U.S. Department of Energy and the U.S. Department of Defense’s Defense Threat Reduction Agency fund this research.